You can optionally mount the server to the floor using the same mounting brackets that secured the server to the shipping pallet. Note - You must supply your own 17-mm bolts, nuts, washers, and any other mounting hardware required to secure the server at your location. 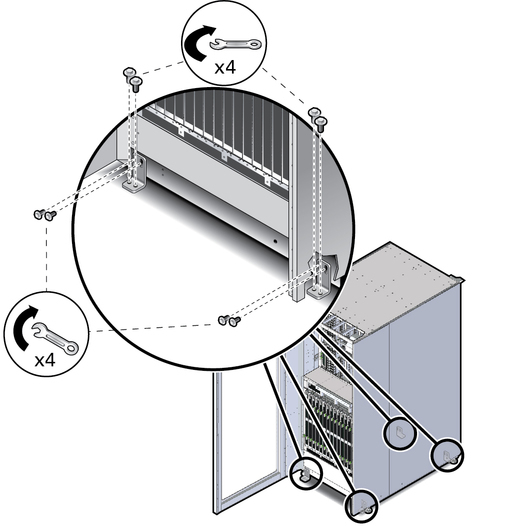 Obtain the four mounting brackets and the eight 13-mm bolts that secured the brackets to the server. Obtain eight 17-mm bolts and washers that will be used to mount the server to floor. Note - Select bolts that are appropriate for your location. These mounting bolts are not included with the server. Drill eight 17-mm holes in the floor for the mounting brackets. 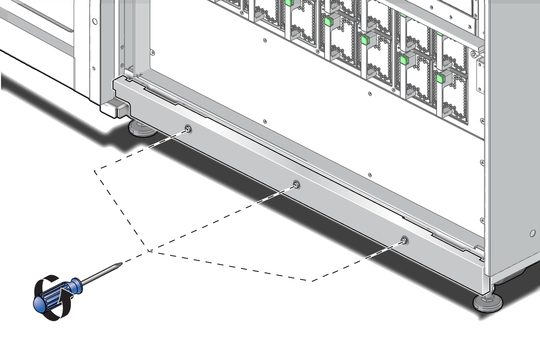 See Mounting Holes and Cable Routing Floor Cutout Specifications for the dimensions of these holes. Position the server over the holes. At the front of the server, use a T20 Torx screwdriver to loosen the three M4 captive screws securing the kick plate to the server. Remove the kick plate from the server and set it aside in a safe location. 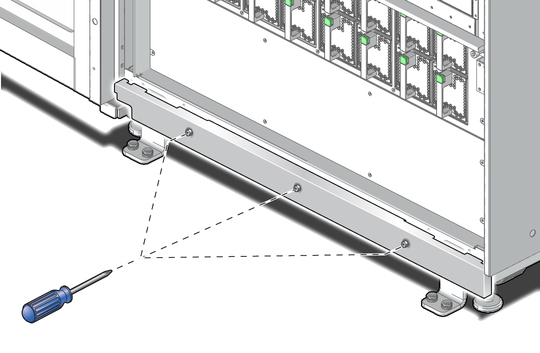 Using a 13-mm wrench, attach the four mounting brackets to the server using 13-mm bolts. Using a 17-mm wrench, mount the server to the floor using the eight 17-mm bolts and washers. Using a T20 Torx screwdriver, secure the kick plate to the server using the three M4 captive screws. Lower the four leveling feet. Lowering the leveling feet will further stabilize the server. See Lower the Leveling Feet.